Sorry to have been away so long. Hope that your new year is off to a good start. This is an interpretation of the entrance to Beaver Creek pottery. Christmas greetings from my studio to you. Merry Christmas to all the followers of this Blog. Thank you. Sorry for the delay. Had this painting done and this post ready for a short commentary. Had intended to post this a week ago. Then life happened and in the rush to finish all preparations for the Christmas, I forgot to publish this post. A belated greeting of Merry Christmas to all of you that follow my posts. Thank you and may you all have a Happy, Healthy and Prosperous 2015. For several years, I have created a new piece of artwork specifically for use on our family Christmas cards. 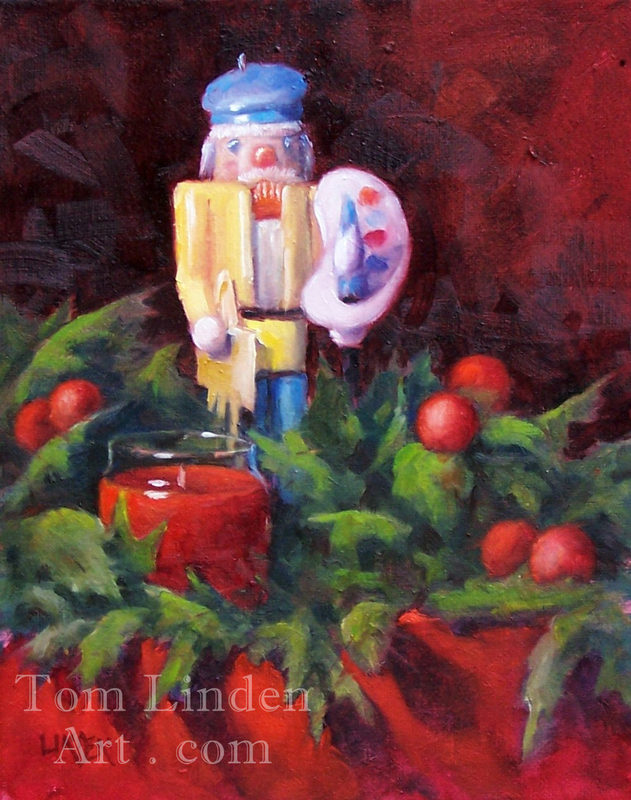 This year I was hoping to get a plein air winter painting for the 2012 edition. As we eased into November, I kept an anxious ear to the weather reports, anticipating the first snowfall of the season which would enable me to get out and paint that perfect scene. Unfortunately, as the days and weeks slipped past, no snow. We had some cold weather, but no snow. A couple weeks before Christmas and no indication of snow. In fact, the weather forecasts were discussing the fact that we had now gone more than 280 days since our last snowfall, nearing record range for this area. I needed to get the cards created and in the mail if I was to beat a self-imposed Christmas deadline. I decided to go through my sketchbook and photo references to find a design which, as necessary, could be altered to be suitable for our Christmas card. 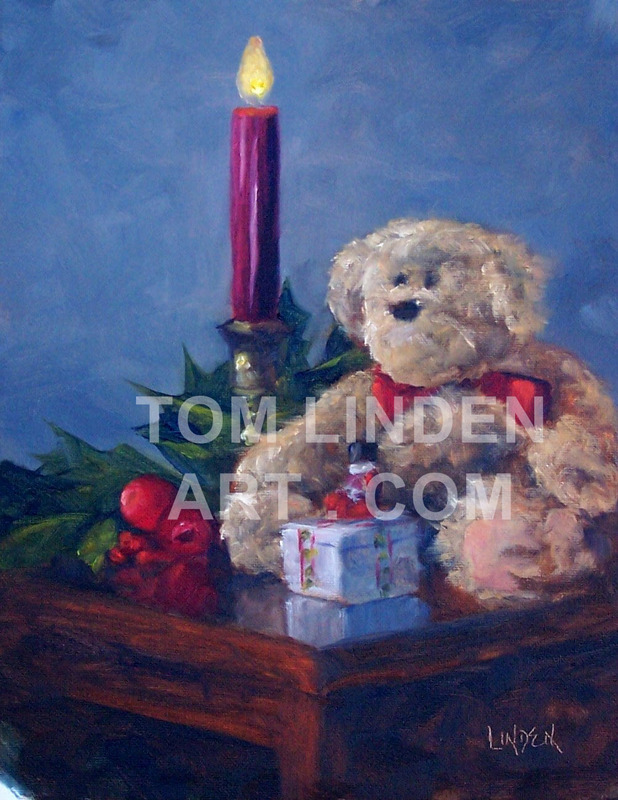 Candle and Teddy Bear, Oil on Canvas 14" x 11"
As we move from autumn to winter, I find that I am spending more time in the studio. Over the summer and early autumn I spent more time outside and tended to neglect housekeeping in the studio. A week ago, I decided that some organization and clean up was in order. In the process, I opted to clear the studio of a few paintings. A few “clinkers”. Paintings that I realize are not good enough. About couple dozen such works. The nice thing with oil paints is that you can apply gesso over old, unsuccessful works and start afresh. For now, each evening before leaving the studio, I grab a few paintings, apply gesso and leave them to dry overnight. Within a few days, I will have less inventory of paintings and a greater inventory of “blank” canvases ready for me to paint. As I was clearing out the clinkers, I came across this work. 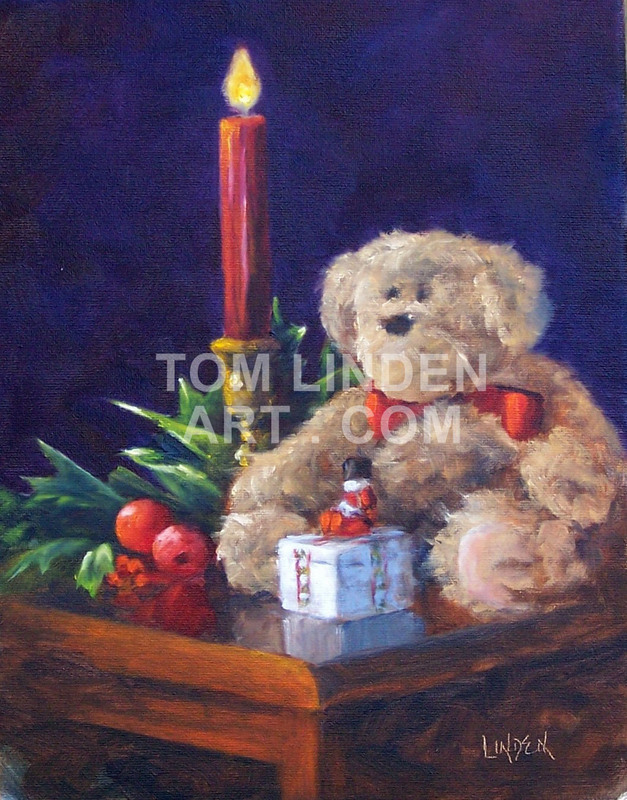 I created this from life last year during the Christmas season. Before destroying this work, I decided to take some time and play with it first. A few touches of paint to the front side of the table. Brighter, more intense colors to the ornaments, greens and candle. Then, darken up the background. I have attached an image of the original design for your comparison.